Home » Summer Motoring » Why is My Car Overheating in Winter? With winter here to stay for a few months, you may think that your vehicle overheating problems are over for one season. Car overheating is synonymous with the summer season, but even when there is no warmth, your vehicle is susceptible to overheating issues. Getting your car ready for winter and keeping the issues that could result in vehicle failure at bay is of course important, there is after all no worse time to breakdown. Overheating is an issue that’s just as common during winter as it is in the summer, but you can prevent this problem or at least spot the signs of overheating early to ensure it doesn’t slow you down this holiday season. With the majority of vehicles utilising internal combustion engines, even extreme cold won’t prevent overheating problems. Engines produce heat all on their own using friction and combustion, meaning they need very little help from the weather conditions outside to overheat. Friction in particular, caused by your engine’s internal components interacting at speed, and combustion produced by the compression of both fuel and air both produce energy, energy that can cause temperatures to rise beyond what your engine can cope with. Your vehicle’s cooling system is charged with keeping your engine’s temperature successfully regulated, whether overheating occurs during the hot summer months or cool winter season. If faults arise within this cooling system, as they commonly do without the right maintenance or repair, your engine cannot be sufficiently cooled. Coolant leaks and blocked thermostats are particularly common and will result in overheating without repair. Low coolant levels and cooling fan failures are other culprits of overheating. Knowing the signs that your vehicle is overheating is important. If you spot the following signs you should avoid driving your vehicle until the underlying issue is fixed. If you are on the road already and symptoms of overheating become apparent, it is advisable that you pull over, turn the engine off and call for professional help. Driving a vehicle that is overheating for a prolonged period can result in difficult and expensive to repair damage to the engine and associated components. Your temperature gauge is reporting a figure above the normal limit. There are many steps you can take to prevent overheating and other winter vehicle problems. Whilst the season is well underway, it’s never too late to complete the driving checks and maintenance musts that prevent issues like overheating. Checking your vehicle’s coolant level and ensuring it’s topped up if it is on the low side is vital in preventing your engine from freezing or overheating. Even sealed systems that shouldn’t need topping up regularly should be checked, particularly if you plan to take on a longer journey. Always check coolant levels when the engine is cold. If they need topping up, make sure you select the right coolant for your make and model of vehicle. Your handbook should provide all the details you need regarding the right coolant for your car. To prevent overheating look out for other potential issues that could affect the success of your vehicle’s cooling system. 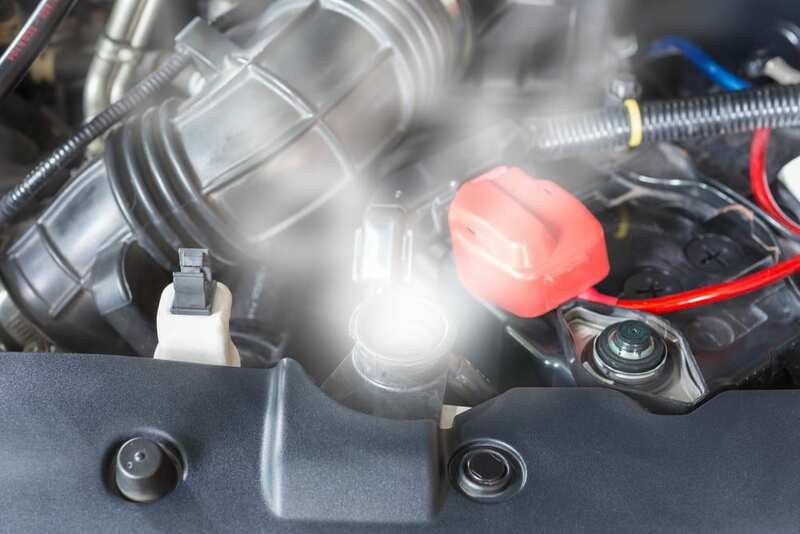 As well as your vehicle’s coolant levels, the condition of the coolant can tell you a lot about its effectiveness, with dirty coolant often the sign of underlying issues. As part of your checks you should also note the condition of your cooling system’s hoses and thermostat, and check for signs of leaks. Checking your cooling fans is another recommendation. This should be completed regularly to ensure both the fan and temperature sensor are in good working order. To check your cooling fans set the car heater to cold, run the car then allow it to stand idle for five minutes. Your cooling fans should begin automatically to reduce the temperature of your engine so make sure you keep an eye on your gauge. If your cooling fan doesn’t cut in or fails to bring the temperature down at an effective rate, you could have a problem with the fan, its wiring or the temperature sensor. Do you suspect that your vehicle has an overheating problem? Don’t delay, let our servicing and repair specialists give it the once over. Contact ustoday to discuss your requirements or book an appointment online.